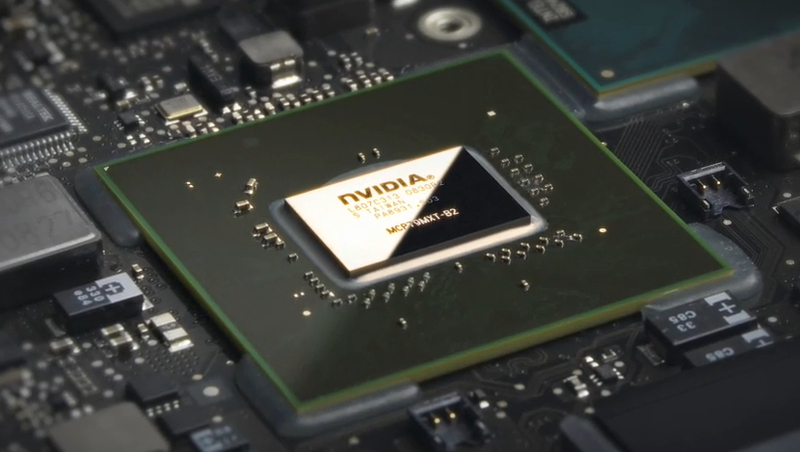 The Nvidia GeForce 9400M G is an integrated (onboard) graphics card for laptops without dedicated graphics memory. The card was introduced in October 2008 in conjunction with the new Apple MacBook, MacBook Pro, and MacBook Air products (called only 9400M). At the time of announcement it was the fastest mGPU (motherboard GPU) on the market. The 9400M G graphics core is used in the MCP79 laptop chipset and in the ION platform for netbooks (which is essentially the same). The ION LE uses the same graphics core, but the DirectX support is limited to 9 (instead of 10). The clock rates of all thre platforms is identical. The performance of the 9400M G is comparable to current entry level GPUs with dedicated graphics memory (like the GeForce 9300M GS).Therefore, the graphics adapater is able to display older games (like Doom3) in high details fluently and new (not too demanding games) in low details fluently. Warhammer Online should for example run on the 2.4 GHz MacBook fluently. Compared to the predecessor in the MacBook, the Intel GMA X3100, the GeForce 9400M should perform 5x better. The current consumption of the mGPU is with a maximum of 12 Watt TDP (for the whole chipset (north- and southbridge are integrated) on par with the current Intel GMA X4500MHD (Centrino 2). As the 9500M G, the 9400M features 16 stream processors that do the work of the former dedicated pixel- and vertex-shaders. The unified shaders of Nvidia are 1-dimensional (AMD has 5-dimensional shaders which leads to the higher number of shaders). The MCP79MX (codename of the GeForce 9400M) can help the CPU in decoding HD videos. It features the PureVideo HD engine (VP3 video processor). Furthermore, the chip can be programmed using CUDA and can accellerate some operations in Photoshop CS4. At the same time the desktop 9300 and 9400 mGPU was presented, which should perform simillarly (the laptop chipset 9400M should perform a bit lower than the 9300).